An orthographic projection of the world, highlighting the European Union and its Member States (green). The European Union (abbreviation: EU) is a confederation of 28 member countries in Europe, started in 1957 as the European Economic Community (EEC). It has created a common economic area with Europe-wide laws allowing people to move and trade in other EU countries almost the same as they do in their own. Seventeen of these countries also share the same type of money: the euro. The Treaty of Lisbon is the most recent treaty that says how the Union is run. Every member state signed to say that they each agreed with what it says. Most importantly, it says which jobs ('powers') the Union should do for the members and which jobs they should do themselves. The members decide how the Union should act by voting for or against proposals. The objective of the EU is to bring its member states closer together with respect of human rights and democracy. It does this with a common style of passport, common rules about fair trading with each other, common agreements about law enforcement, and other agreements. Most members share a common currency (the euro) and most allow people to travel from one country to another without having to show a passport. After World War II, the countries in Europe wanted to live peacefully together and help one another's economies. Instead of fighting for coal and steel, the first member countries (West) Germany, France, Italy, Belgium, Netherlands, and Luxembourg created one European Coal and Steel Community in 1952. In 1957 in the Italian city of Rome, the member countries signed another treaty and made the European Economic Community. Now it was a community for coal, steel and for trade. Later it changed the name to the European Community. In 1993, with the Treaty of Maastricht it changed its name to the European Union. Now the member countries work together not only in politics and economy (coal, steel and trade), but also in money, justice (laws), and foreign affairs. With the Schengen Agreement, 22 member countries of the EU opened their borders to each other, so people can now travel from one country to the other without a passport or identity card. Now already 16 member countries have replaced their national currencies with the euro. 10 new countries became members of the EU in 2004, 2 more became members in 2007, and 1 more in 2013. Today there are 28 member countries altogether. A person who is a citizen of a European Union country can live and work in any of the other 27 member countries without needing a work permit or visa. For example, a British person can move to Greece to work there, or just to live there, and he or she does not need permission from an authority in Greece. In the same way, products made in one member country can be sold in any other member country without any special permissions or extra taxes. For this reason, the members agree rules on product safety - they want to know that a product made in another country will be as safe as it would be if it had been made in their own country. 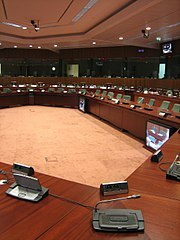 The Council of the European Union is the main decision-making group. The cabinet ministers of the member countries meet (Ministers for Foreign affairs, for Agriculture, for Justice, etc...) and discuss issues that are important to them. Before the Treaty of Lisbon (written in 2007, implemented in 2008) each member state takes a turn at being President of the Council for six months. For example, from January 2007 until July 2007, Germany held the presidency. The six months before that, Finland held the presidency. Now the President of the European Union chairs the council summits. The President of the Council is the organiser and manager and is voted into office for a duration of two and a half years. He or she does not have the power to make decisions about the European Union like the President of the United States does for that country. Member countries with a large population (Germany, France, United Kingdom, etc.) have more votes than countries with small populations (Luxembourg, Malta, etc.) but a decision cannot be made if enough countries vote against the decision. Twice a year, the heads of government (Prime Ministers) and/or the heads of state (Presidents) meet to talk about the main issues and make decisions on different issues. This meeting is different and not as formal. It is known as a European Council. Note: This is not the same thing as the Council of Europe, which is not part of the European Union. The European Commission runs the day to day running of the EU and writes laws, like a government. Laws written by the Commission are discussed and changed by the European Parliament and the Council of the European Union. The Commission has one President and 27 Commissioners, selected by the European Council. The Commission President is appointed by the European Council with the approval of the European Parliament. The Commission operates like a cabinet government. There is one Commissioner per member state, though Commissioners are bound to represent the interests of the EU as a whole rather than their home state. The Parliament has a total of 785 members (called Members of the European Parliament, or MEP). They are elected in their countries every five years by the citizens of the European Union member countries. The Parliament can approve, reject or change proposed laws. It can also sack the European Commission. In that case, the entire commission would have to give up their jobs. There are many discussions in the EU about how it should develop and change in the future. The need to prevent another European war after World War I and World War II. The need to have a common economic area. In 1951, six countries made the European Coal and Steel Community, a basic version of what the EU is now. These six then went further and in 1957 they made the European Economic Community and the European Coal and Steel Community. The UK and others decided not to join, and then when the UK changed its mind it was stopped from joining by French President Charles de Gaulle. When he was no longer President, the UK and others started to join. Today there are 28 members but the idea that more should join is not seen as a good one by everyone. The member states of the European Union highlighted in light brown. ↑ East Germany and West Germany became one country in 1990. Since then the whole of Germany is an EU member country. ↑ Greenland joined as part of Denmark, but was given some power to rule itself afterwards. With this power, it decided to leave the EEC. ↑ Although Northern Cyprus is officially part of Cyprus (and the EU), it is not actually controlled by the Government of Cyprus and its passports are not accepted by EU members. Serbia, Montenegro, the Republic of Macedonia, Turkey and Iceland are "candidate countries", they are being considered for membership. Albania, Bosnia and Herzegovina and Kosovo are expected to follow. United in diversity (or together with many types of people in Simple English), is the motto of the European Union. ↑ Barnard, Catherine (August 2007). The Substantive Law of the EU: The four freedoms (2 ed.). Oxford University Press. p. 447. ISBN 9780199290352 . ↑ 2.0 2.1 "United in diversity". Europa (web portal). European Commission. http://europa.eu/abc/symbols/motto/index_en.htm. Retrieved 20 January 2010. "'United in diversity' is the motto of the European Union. The motto means that, via the EU, Europeans are united in working together for peace and prosperity, and that the many different cultures, traditions and languages in Europe are a positive asset for the continent." ↑ "European Parliament: The Legislative Observatory". Europa (web portal). European Commission. http://www.europarl.europa.eu/oeil/FindByProcnum.do?lang=en&procnum=REG/2007/2240. Retrieved 20 January 2010. "the motto 'United in diversity' shall be reproduced on Parliament's official documents;"
↑ "Brussels' EU capital role seen as irreversible". Euractiv.com. http://www.euractiv.com/pa/brussels-eu-capital-role-seen-ir-news-494302. Retrieved 28 October 2012. "Brussels has become the de facto capital of the European Union"
↑ Brussels, Capital of European Union - European Commission, 2001. ↑ The New Oxford American Dictionary, Second Edn., Erin McKean (editor), 2051 pages, May 2005, Oxford University Press, ISBN 0-19-517077-6. ↑ "Total population as of 1 January". Eurostat. http://epp.eurostat.ec.europa.eu/tgm/table.do?tab=table&language=en&pcode=tps00001&tableSelection=1&footnotes=yes&labeling=labels&plugin=1. Retrieved 23 October 2010. ↑ 8.0 8.1 8.2 "IMF World Economic Outlook Database, April 2012". International Monetary Fund. http://www.imf.org/external/pubs/ft/weo/2012/01/weodata/weorept.aspx?pr.x=39&pr.y=17&sy=2008&ey=2012&scsm=1&ssd=1&sort=country&ds=.&br=1&c=998&s=NGDPD%2CPPPGDP%2CPPPPC&grp=1&a=1. Retrieved 23 April 2012. ↑ "Distribution of family income – Gini index". The World Factbook. CIA. https://www.cia.gov/library/publications/the-world-factbook/fields/2172.html. Retrieved 2012-01-28. ↑ Calculated using UNDP data for the member states with weighted population. ↑ .eu is representative of the whole of the EU; member states also have their own TLDs. ↑ "Institutions: The European Commission". http://europa.eu/institutions/inst/comm/index_en.htm. Retrieved 2007-06-25. ↑ "Parliament's powers and procedures". European Parliament. http://www.europarl.europa.eu/parliament/public/staticDisplay.do?language=EN&id=46. Retrieved 2007-06-12. ↑ "Institutions of the EU: The European Commission". http://europa.eu/institutions/inst/comm/index_en.htm. Retrieved 2007-06-18. ↑ "Croatia to become EU member 1 July 2013". Croatian Times. May 23, 2011. http://www.croatiantimes.com/news/General_News/2011-05-23/19468/Croatia_to_become_EU_member_1_July_2013. Retrieved November 17, 2011. This page was last changed on 15 December 2014, at 15:20.